First of all i thank all my readers for your great support towards the COOKING FOR GUESTS series. After successfully doing this for almost 5 months i thought i will move on to other series which i feel will be more useful for beginners in cooking. I am getting mails asking to post microwave cooking recipes and i thought i will combine the series with Indian Kitchen basics , Indian microwave cooking, and bachelor recipes too. Recently i got a full time helper at home and she is a not an Indian nationality. So teaching her the kitchen basics and introduction to spices and telling her to cook rice is a great challenge for me. Though i never allow her to do any cooking, but i still want her to learn the basics and i thought i will record the same here and it will help the newly married and the bachelors too. Twice i had been to India for a wedding leaving hubby and kids at home. During those times my friends would send food for them. But rice my hubby will keep at home. For that, i need to give training for him as it is totally new to him.So considering the men who are like him , i hope this series will be more useful and make them learn the basic cooking. I hope you enjoy this series and continue to give a great support to me as you give always. 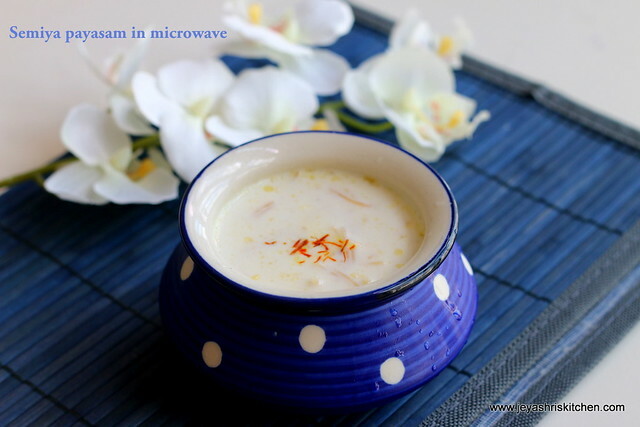 For today to start with i made Microwave Semiya payasam. My mom is an expert in microwave cooking i say, as she makes so many dishes on microwave if there is a need. Especially when they go for holiday, if there is a microwave i the resort room, she full do the entire cooking in Microwave. 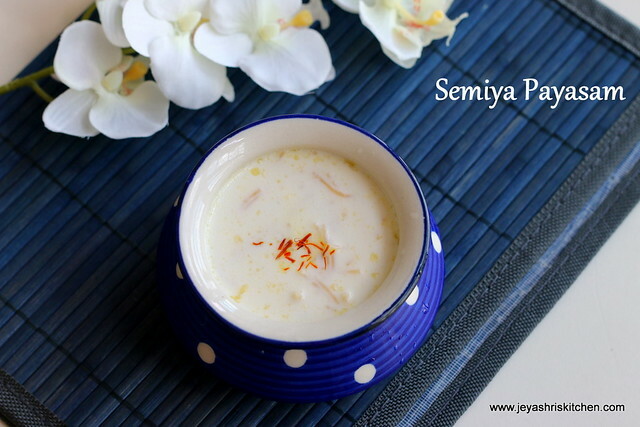 I tried the semiya payasam in microwave and it turned out very nice. 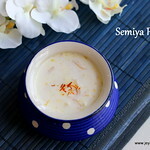 Here is the recipe of semiya Kheer in microwave. 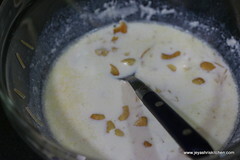 Check out my stove top Vermicelli payasam. Time varies from microwave to microwave. So i have given the time according to my oven. 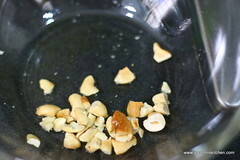 In a microwave safe bowl (use a glass bowl, do not use plastic) add ghee and add the broken cashew nuts . Microwave it for 2 minutes. Stir in between. Let this golden brown. Keep it aside. 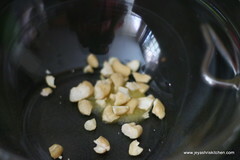 Roast the semiya in the same bowl, as it has ghee no need to add extra ghee. I used roasted semiya. If using non roasted one, roast for 3-4 minutes without getting it burnt. 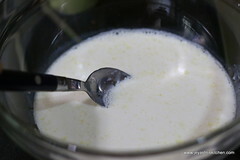 Add milk to this now and cook for 7 minutes, stir in between. Let the semiya cook . It will become soft. 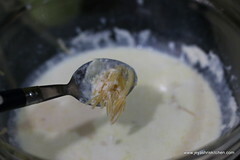 If adding condensed milk add at this stage. Mix well. Add sugar and mix well. Do not boil after adding milk. Add cardamom powder or saffron if adding. Add the roasted cashew nuts to this and mix well. See you all soon with some interesting recipes in the coming week. Stay tuned for more interesting recipes in this series. Hi Jeyashri, Good luck on the new series ! 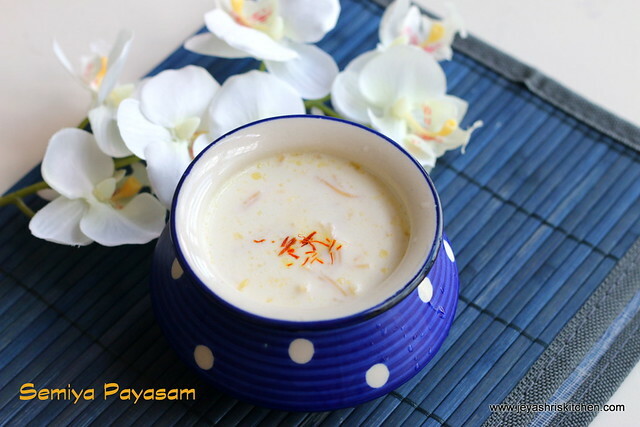 Super delicious payasam, i do often this kind of simple sweets with MW..